The phrase "Serenity's Power" came to me this week. It may have been Divine inspiration, but it didn't appear in a meditation or a dream. It was the subject line of an email on the topic of the electricity in one of our housing accommodations, Serenity House! It's a great phrase that caught my attention. When you can remain serene, it is far easier to connect with Divine Power within. (Click to the August newsletter on the topic of Divine Power.) I find I can't always accomplish it. But the more I can do it, the easier it comes, it's a reinforcing cycle. Do it some, and you will feel the huge benefits and observe the improved conditions around you. Connecting with the Divine, through daily meditation and prayers, makes life less stressful – and you feel more serene! Divine power can than work more through you. We currently have several programs coming up that will help you increase your own serenity. Please see some of them on the upcoming retreats listed below. You are invited to join all the members of Ananda Village, as we take time off work to participate in this annual uplifting of our spiritual lives. The Temple is alive with the presence of God and with a sense of loving sharing and commitment. Over the years, guests newer to the spiritual path have joined us and received a tremendous beginning to a new, spiritualized life. 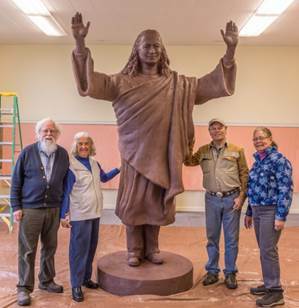 Ananda News: Yogananda Gardens Northwest, located at Ananda Laurelwood, will feature the largest statue of Yogananda in the country. Master sculptor Gary Roller has now completed sculpting this eight-foot high statue. It has been to the foundry and back for making the mother mold from which the bronze centerpiece of the gardens is being made. L-R Byasa, Janakidevi, Gary Roller, Jayashree. Be part of this magnificent project by supporting the manifestation of a bronze statue to be dedicated on June 23, 2018 as part of the Ananda Laurelwood Yogafest weekend. Donate here. (2:48) O Dhananjaya (Arjuna), immerse yourself in the thought of yoga (union with God), inwardly non-attached and even-minded in both success and failure. 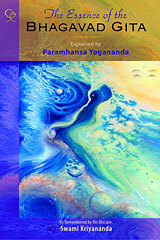 Perfect evenness of mind and feeling is itself the definition of yoga. Feb 16 - 18 Keys to a Quiet, Powerful mind. Mar 9 - 11 You'll be amazed how much you can learn!